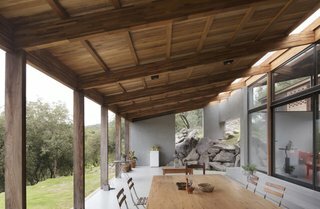 Located near a quarry in the Argentinian town of Unquillo, just north of Córdoba, Casa JB is a home in conversation with the rocky landscape. 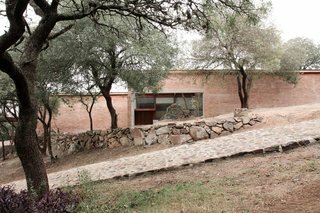 Alarcia Ferrer Arquitectos played with the form of the house to strategically incorporate two significant, natural stone outcrops. The results present a unique interior landscape that echoes the environment. 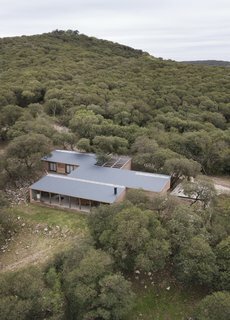 An aerial view of Casa JB shows its three volumes. 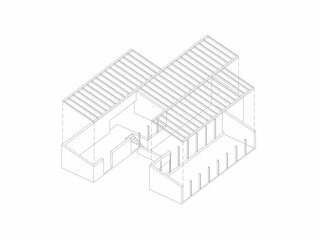 The home is divided into three separate volumes, each of equal importance, that contain the private, public, and semi-covered spaces of the house. 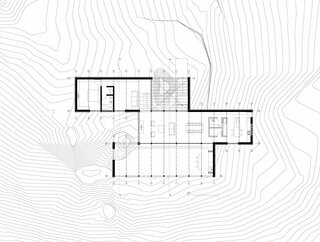 This layout naturally connects the home to the terrain in half levels—guaranteeing a view of the distant mountain ranges from almost every angle. The rocky outcrops anchor the home and provide a distinctive, aesthetic touch. The side view shows an outcropping of rocks. 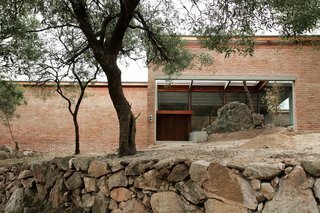 The first outcropping of rocks has been incorporated into the home's entrance, which is set adjacent to a rustic, stone road. 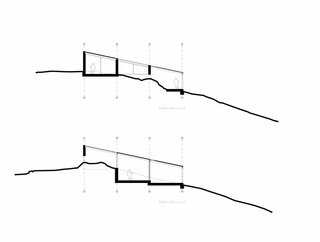 The first rocky outcrop creates the home’s entrance patio, which helps further articulate the divide between the public and private space. A closer look at the entry. 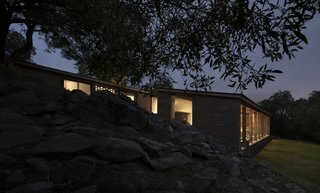 The outcrop of rock and a tree have been incorporated into the design of the home. The courtyard-like composition, and the natural flow of light and air, provide the interiors with an indoor/outdoor feel. 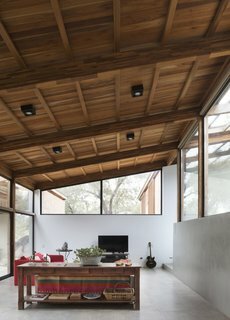 Load-bearing, brick walls support an inclined roof including a wooden, pergola-type structure that seamlessly connects with wood-paneled ceilings inside. 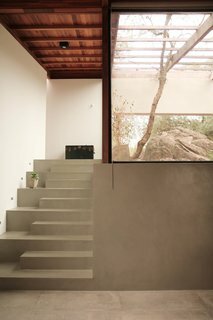 The construction allows light to enter the home and gives the interiors a sense of spatial continuity. 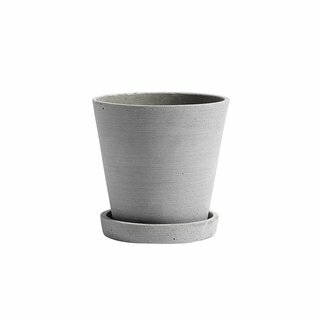 Large flowerpot with detached saucer from Hay Design in Grey. Minimalist design made from a modern composite material. 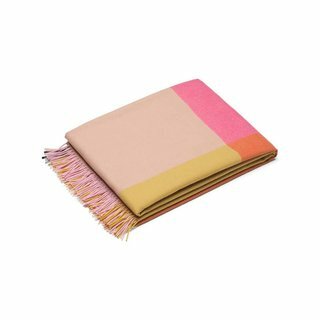 Big, bold blocks of contrasting color make this fringed blanket stylish—while Peruvian highland wool makes it deliciously soft and sturdy. The blanket was designed in 2016 by Hella Jongerius as part of her work on the Vitra Colour Library. Take a trip to Italy while enjoying a meal with friends in your home with the iconic Paesaggio Italiano set. 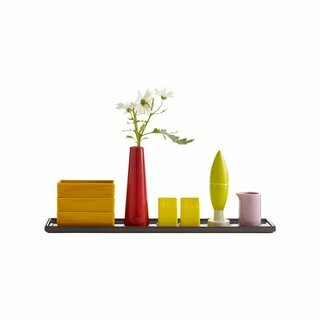 Designed by architect and designer Aldo Cibic, this kitchen table set brings a miniature version of the charming Italian countryside to your dining table. The luminous entrance opens into a bright and lofty living space. 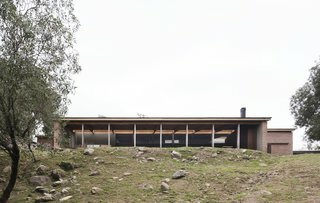 The indoor/outdoor patio opens to the sloping terrain. 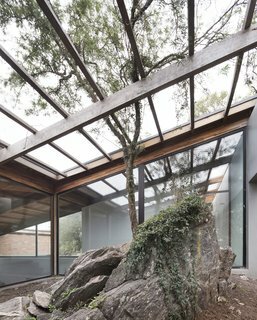 The second rocky outcrop, seen in the background, almost seems to "invade" the indoor/outdoor patio space at the rear of the home, reasserting nature into the built environment. The patio looks out to captivating views. 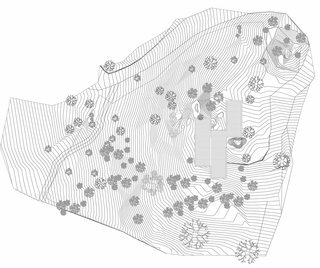 Crosssection of the site plan for Casa JB.